Hope HealthCare Services has succeeded in “bringing Hope close to home” for thousands of residents of eastern Lee, Glades and Hendry counties. Construction is now complete on the Hope HealthCare Services Center in Lehigh Acres, the only health care center of its kind in the state of Florida. Set to open in mid-April, the Center will serve eastern Lee County, including Buckingham, Alva, Gateway, Lehigh Acres and Pelican Preserve, as well as Hendry and Glades counties. The Center will also serve as a hurricane shelter for hospice patients living at home who cannot be placed in public shelters. As an added benefit to the community, the Center will receive certification for meeting international standards of environmental quality and energy efficiency. 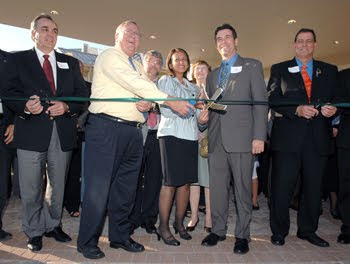 The Hope HealthCare Services Center is located at 1201 Wings Way in Lehigh Acres, on five acres of land donated by the Community Health Association.